Glaucoma is a group of eye conditions which progressively damage the major nerve of vision known as optic nerve. 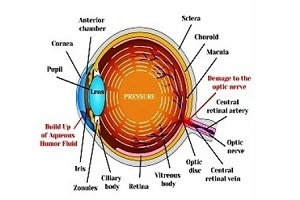 Optic nerves carry information to the brain about what is being seen from the eyes. 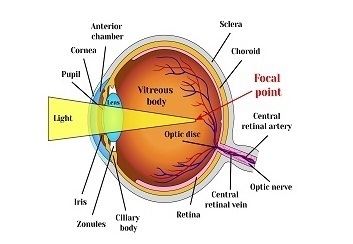 When light falls on the eyes from the object, it passes through lenses of the eyes and falls on retina and the retina generates nerve impulse which is transmitted to the brain by the optic nerve so as to convert the electrical signals into vision. Glaucoma is an eye disorder which is characterized by the pattern of progressive damage to optic nerve and gradually a permanent loss of vision. It commonly begins with the loss of peripheral or side vision and if not diagnosed and treated on time leads to gradual loss of the central vision too leading to permanent blindness. This is the most common form of glaucoma. It is also called wide-angle glaucoma and its prevalence increases with an increase in age of a person and is a chronic disease. This is caused by the increased fluid pressure inside the eye due to clogging of trabecular meshwork - the drainage system of the eye. Although, the coming of the fluid to the drainage system means the drainage angle of the eye is open, but the fluid is not drained out of the eye due to clogging of the drainage system somewhere inside it leading to the damage of optic nerve and disease development. In some people, the iris is positioned near to the drainage angle of the eye and thus blockage of the drainage angle of the eye by the iris leads to this disease. A complete blockage of the drainage angle of the eye leads to sudden and quick increase in eye pressure called as acute attack. This disease is majorly caused by a rise in the fluid pressure within the eyes. Usually, both the eyes are affected due the disease, but sometimes only one eye is more severely affected. Fluid pressure rises inside your eyes (called as ocular hypertension) because the clear fluid that flows in and out of the anterior chamber (small space in front of the eye) of the eyes and nourishes the surrounding tissues of the eye drains too slowly out of the eyes. The slow draining of the fluid from the eyes leads to deposition of fluid inside the eye and gradual rise in the fluid level leads to ocular hypertension that damages the optic nerve and marks the beginning of glaucoma. Glaucoma is generally but not always caused by the ocular hypertension or eye pressure that leads to damage of the optic nerve. It is also seen that sometimes glaucoma affects people with normal eye pressure too which happens because of impaired regulation of the blood flow to the optic nerve of your eye. Read more about causes of glaucoma. If the eye pressure is not diagnosed and treated at early stages, it leads to gradual damage to the peripheral vision and may also affect central vision of the eye leading to a permanent vision loss gradually, in some cases. 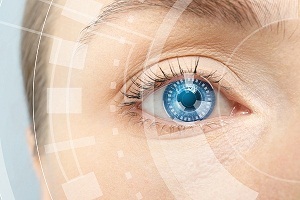 Read about treating of glaucoma. The vision lost due to glaucoma is not recovered, but it is possible to retain useful sight for life by early diagnosis and treatment of glaucoma. The only way to detect and diagnose glaucoma is through eye check up by the optician. Read about diagnosis of glaucoma. Glaucoma is very dangerous because its monitoring and early detection is not easily possible because the symptoms are usually not visible at early stages of the disease. But, once the disease progresses to the point where it is irreversible, it shows symptoms such as impaired vision or loss of peripheral vision or blurred vision and pain in the eyes. At this point, the loss of vision is irreversible and the additional condition which occurs due to disease is difficult to stop. 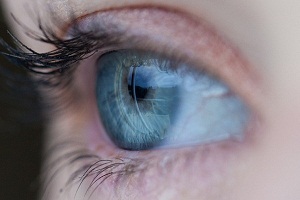 Read about early signs and symptoms of glaucoma. Glaucoma is mainly seen in people above 40 years of age. It is also believed that it is an inherited one. A person of age 40 and above is at higher risk of getting it. A person with this age and with a family history of glaucoma should visit doctor for eye examination in every 1 to 2 years. If a person has health issues such as diabetes that are linked to certain eye complications and has a family history of glaucoma, he or she is must get frequent eye checkups done to monitor any defects and disease development. In the U.S, glaucoma is the second leading cause of blindness after macular degeneration and also the second leading cause of blindness worldwide after cataract. According to the American Academy of Ophthalmology, an estimated 2.2 million people in the U.S are affected by the most common type of glaucoma called primary open-angle glaucoma. The number is expected to increase as the U.S population ages to 3.3 million by the year 2020. Due to no symptoms at early stages, about half of the U.S population doesn’t know that they have glaucoma. Myopia (Nearsightedness): Causes, Risk Factors and Symptoms What causes Myopia? 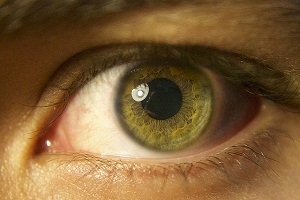 Short-sightedness or myopia is a refractive error in which the light rays coming from the object focus in front of the retina instead of directly. . . .
Gene Therapy For Color Blindness Color blindness, also known as color vision deficiency, occurs when photoreceptors in the retina of the eye lack certain light-sensitive pigments. In most cases, colorblindness. . . .